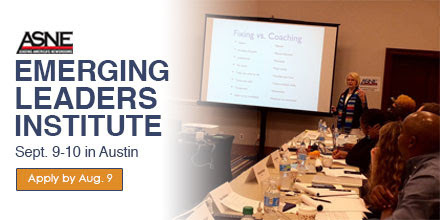 Submit your application by tonight to be considered for the ASNE Emerging Leaders Institute Sept. 9-10 in Austin, Texas. This free training is designed to help mid-level news managers with diverse backgrounds develop and improve their leadership and strategic skills. Accepted candidates will receive up to $700 of travel reimbursements, thanks to our generous sponsors, the American Press Institute, the Gannett Foundation, the John S. and James L. Knight Foundation and Loyola University Chicago. For two full days, the institute will cover the most pressing issues for leaders and the skills needed to lead and drive change. Some of the topics on the program include coaching and feedback, leadership style, news values in digital platforms and social media environments, goal-setting and strategy, financial leadership, design-thinking and innovation. Click here for a sample program.